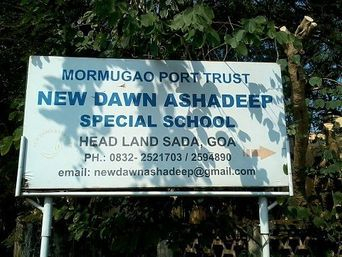 From its institution in 1997, with a total of eight students and one classroom, New Dawn Ashadeep School for special children has come a long way to include eleven classrooms, from primary care group to vocational classes, harbouring a hundred and seventeen students. It is, significantly, the only special school in Goa that has speech and occupational therapy and physiotherapy. Former headmistress Vinny Fernandes, who completed seventeen years at the school, enlightens us on its functioning and focus. ‘I have been here since the inception of the school, even before the actual building came up. I joined somewhere in February, 1997,’ she says. The school was the result of one man’s vision to provide easy access to scholastic amenities and practical training for special children. In the absence of such a school in the whole of Vasco, Vijay Chandran, who was employed with the customs office, decided to bring about a change in the situation. As a parent of a special child he had to travel to Panaji to have his child attend People’s School for Appropriate Learning. Occupational therapy benefits students by training them to overcome the effects of their respective disabilities. ‘This is therapy given to students when there is a delay in milestones such as eating, learning to use the toilet, neck control, standing and sitting,’ explains Vinny Fernandes. Using neurodevelopmental exercises, or sensory exercises as done for autistic children because they have sensory impairment, there is an attempt to initiate some degree of empowerment. Depending upon the severity of the child’s condition, the improvement also differs across a spectrum. There are cases where children achieve neck control, sitting posture and the ability to walk to the point of normality. In physiotherapy there is mainly strengthening of muscles. Besides the regular curriculum, the students also have renowned choreographer Mamta Hussein, who comes once a week to train the children (including severe cases) in dance therapy. The physical training teacher focuses on indoor and outdoor games leading to participation in the Special Olympics. The children are exposed to a gamut of activities which builds self-confidence and skills. 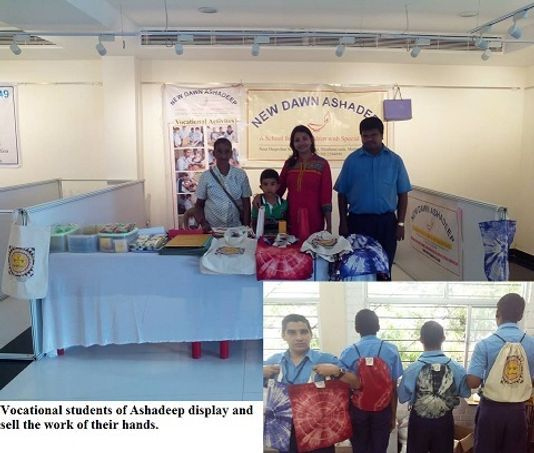 New Dawn Ashadeep School was the first to initiate a cultural platform for special children in Goa. More than seventy percent of the students are custodial cases, that is, severe to moderate cases. There are about thirty percent who are mildly disabled and educable. Custodial cases need constant care and cannot follow a comprehensive curriculum. They are limited to training in basic life skills such as eating, dressing themselves, etc. The school is open to children who are mentally challenged, autistic, hearing impaired, and those who have associated disabilities such as cerebral palsy with mental retardation and hearing impaired with orthopaedic problems. Fernandes tells us about a child afflicted with Cri-du-chat (cat’s cry) syndrome. ‘It is a rare disorder where the child used to cry like a cat…. Today with therapy he is standing. When he came to us he was crawling. He can speak too… not in full sentences but he uses words,’ she says. The multidisciplinary team consisting of teachers and therapists, and the involvement of students in sports and dance as well, is crucial to the all-round development of the children, increasing the chances of their improvement. There is a steady stream of admissions with no one being rejected. Nonetheless, the school is not equipped to deal with every disability, for example, the teaching of Braille is beyond their scope. These cases are redirected to special schools that can train the children in the concerned area. ‘There was a very small child directed by Dr Nandita of Sethu Centre to our school but we have redirected him to NAB (National Association for the Blind),’ Fernandes informs us. Niky Prabhu has a bachelor’s and a master’s degree in Speech Therapy. She gives individual attention to students with speech problems and has various instruments to aid her. She asserts that while therapy helps to a certain extent it is not a sure way of learning how to speak. ‘Some of the children will never go beyond a particular level because speech is an activity that involves the intellect and not all have the same intellectual capacity,’ she says. Some of the children arrive completely unable to speak because the parents have not made the effort to train them or have given up speaking to them because they are slow. Often they become frustrated with their children when they cannot perform on par with other children. Parents hide away these children for fear of being stigmatised. If society were to view them without prejudice parents would be braver in the approach to their special children. At Ashadeep, parents realise there are people facing a similar maelstrom as they are and some are worse off. This promotes a sense of community feeling. Once they are eighteen and above, students are imparted vocational training in the categories of file making, photo copying, candle making, screen printing and hand embroidery. They also learn to make lamps and lanterns, cloth bags, paper bags and pillow and cushion covers. Amarjit Raut and Harish Chodankar are part of the team teaching the students in the vocational class. Students that have mild disabilities are usually placed in open employment situations such as in shops, offices and stores. Other mild category students would be placed in supported employment where they work with normal people as assistants. Self-employment is when some high functioning mild category children work along with their parents. Market surveys are conducted to find out the popular products in demand and different government schemes are made available to the students through the school. The students are not always successful working elsewhere. These are welcomed back into the fold of the school and the profit earned from their output is distributed among them. The sheltered workshop was started by the school for moderate to severely mentally incapacitated students. Here each stage of any work, for example file making, is divided among groups of students. One group would deal exclusively with corner cutting and another with creasing, etc. The school has proved to be a great boon to those society often disdains and relegates to the sidelines. The custodians of these special children are encouraged to accept and appreciate them as God meant them to be.